Diana Canals never liked public speaking. 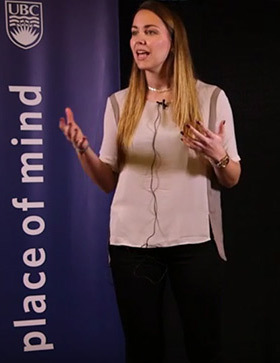 “I panic, I get really stressed out, and I can’t sleep for days leading up to it.” As the runner-up prize winner of the UBC Three Minute Thesis (3MT) final competition held on March 10, the young researcher has certainly changed for the better. Canals first joined the 3MT competition as a step towards achieving her New Year’s resolution to become a more confident public speaker. By the end, she learned how to gain the confidence she needed, and discovered a fun and valuable experience in the process. “I think at first I was just volunteering to communicate my research, and it was just for me. I didn’t know I was going to pass the first round, and I almost didn’t.” However, when Canals sat in the audience, she realized that it was an eye-opening experience to hear about research in a field one knows nothing about. The communication to a lay audience, certainly, was the greatest challenge. Most graduate students in the medical sciences don’t have any exposure to training in science communications, and they worry that one’s topic is too obscure and too complicated for the lay public. Canals, after going to every science communications workshop she could find, and studying past 3MT presentations, came to the conclusion that there is always a way to make research understandable and relevant to the public. “You are just in too deep, so you may not see it. Sometimes it takes a non-scientific person to tell you that what you do is actually pretty cool and relevant”, said Canals. Canals agrees that science communications is hard. Scientists are trained to explain every detail of their research, afraid to mislead the audience or misrepresent their work, which often causes unnecessary confusion. The trick is to “pick one aspect of the research, and break it down for the audience. It’s something all scientists are able to improve on”, Canals suggests. In the first round at 3MT CBR Heat, she was simply presenting her research, focusing on the discovery process. But she quickly learned to change her strategy, and the audience responded much better to stories of personal relevance or social importance, rather than scientific jargon. The challenge is exacerbated by the fact that some scientific disciplines are not well communicated by the media. In Canals’ case, many people have heard the word metastasis, but few actually knew what it is. In her practice presentations, some of her friends were surprised to learn that metastasis means the spread of cancer, rather than the over-growth of the tumor. “A simple explanation was enough to help someone understand, and we can do this for any research topic”, Canals said. Confusion in the general public about medical sciences is the reason Canals believes researchers need to be proactive communicators, instead of waiting for the media to speak on their behalves. This objective is aligned with the Canadian Institutes of Health Research, with their mandate to translate knowledge and to communicate the scientific research. “If we did more outreach, and explained more what’s happening, there would be greater understanding in the general public, and that would help us as well”. At the end, the benefits of this experience can be just as profound. Thinking back on the countless hours she spent on repetitive experiments, Canals reflects that “sometimes technical work can make you lose perspective.” But through learning how to communicate her research, she’s regained her passion, and a renewed sense of purpose.